AMMONNEWS - There are more things that unite the Arab world and Europe than divide them, said Minister of Foreign Affairs and Expatriates Ayman Safadi. Addressing Arab and European leaders at their first joint summit at the Red Sea resort of Sharm El-Sheikh, Safadi said that building on commonalities yields security and economic interests, stressing the correlation between the security of the Arab region and the stability of Europe that made Arab-European cooperation a necessity. He also said that the Palestinian-Israeli conflict is the core cause of tension and instability in the region, and has wrought untold suffering on the Palestinian people, whose cause is "our primary issue". The only avenue towards comprehensive peace is to resolve the conflict on the basis of the two-state solution that puts an end to the occupation, ensures the establishment of a sovereign Palestinian state on the borders of 4 June, 1967 in accordance with the International Legitimacy Resolutions, the minister stressed. He said Jerusalem, a city holy to Muslims, Christians and Jews, is the key to peace as His Majesty King Abdullah, the custodian of the city's holy places, constantly affirms. 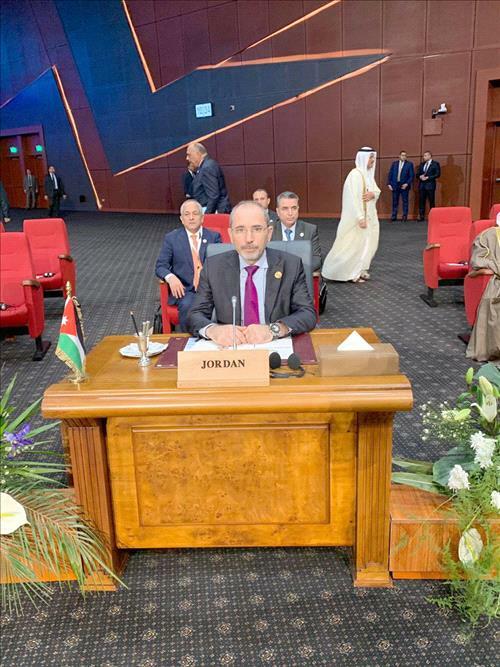 Safadi, moreover, said Jordan will continue to dedicate all its potentials to safeguarding Jerusalem's holy sites and preserving its Arab, Islamic and Christian identity. afadi also voiced Jordan's appreciation for European Union support of a two-state solution as well as assistance to the United Nations Relief and Works Agency (UNRWA) to enable it continue its services to Palestinian refugees. He further hailed the EU for supporting the Syrian refugees, and hoped that the Brussels upcoming conference demonstrates a commitment towards the refugees and their host countries. The minister, who deputized for the King as head of Jordan's delegation to the summit, thanked Egyptian President Abdel Fattah el-Sisi for hosting the high-level meeting, as well as the Arab League and the EU for their efforts. He also underscored the need to step up efforts to realize a political solution to the Syrian crisis to enable the voluntary return of refugees to their country. On Yemen, Safadi said there has to be an end to the suffering in the Arab country in line with UN resolution 2216 and agreed terms of reference. The stability of the region, Safadi stressed, requires that regional relations should be based on good neighbourliness and non-interference in the internal affairs of other countries. He said that "our partnership" has a common interest and that Jordan will always be an effective partner and initiator of institutionalized Arab-European action to expand capacities to build the future that enshrines a culture of dialogue and moderation.